Another wild individual from Thailand. Type locality is given simply as ‘Java, Indonesia’, and this species is currently understood to occur throughout much of Southeast Asia including major river systems in Thailand, Laos, Cambodia, Vietnam and Peninsular Malaysia plus the Greater Sunda Islands of Sumatra, Borneo and Java. It’s been extensively recorded from the Mekong, Chao Phraya, Batang Hari, Rajang and Kapuas rivers plus numerous smaller drainages across this range. Kottelat and Widjanarti (2005) report that it tends to occur in fast-flowing water and is abundant at the end of the wet season in the Danau Sentarum lakes complex, West Kalimantan (Kalimantan Barat) province, Indonesia (Borneo). In the Mekong it’s said to be most common in the lowland floodplains but also occurs in some higher altitude habitats in the middle part of the system (Rainboth, 1996). Chiefly a predator feeding on crustaceans, invertebrates and smaller fishes in nature, although there should be no need to use such live foods in captivity. K. bichirris is gregarious and tends to form schools so ideally four or more specimens should be purchased. Adult males should appear noticeably slimmer than females. 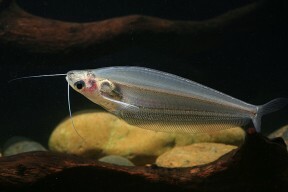 This species is uncommon in the aquarium trade although it’s name has been widely misapplied to the congener K. vitreolus in older literature. These two are easily told apart since K. bichirris does not possess a transparent body in life.